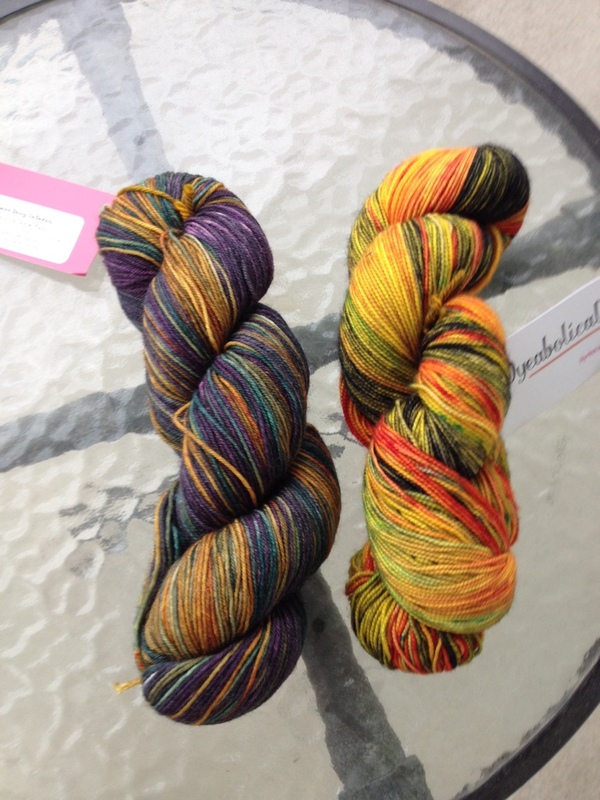 As I mentioned prior to this, I am doing some sample knitting for dyeabolical yarns. 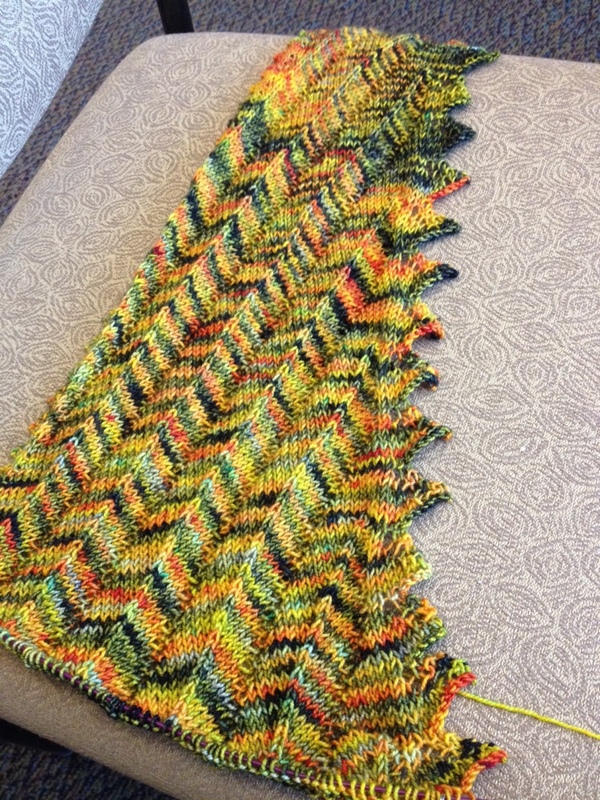 I managed to finish the Vittorio Shawlette already! 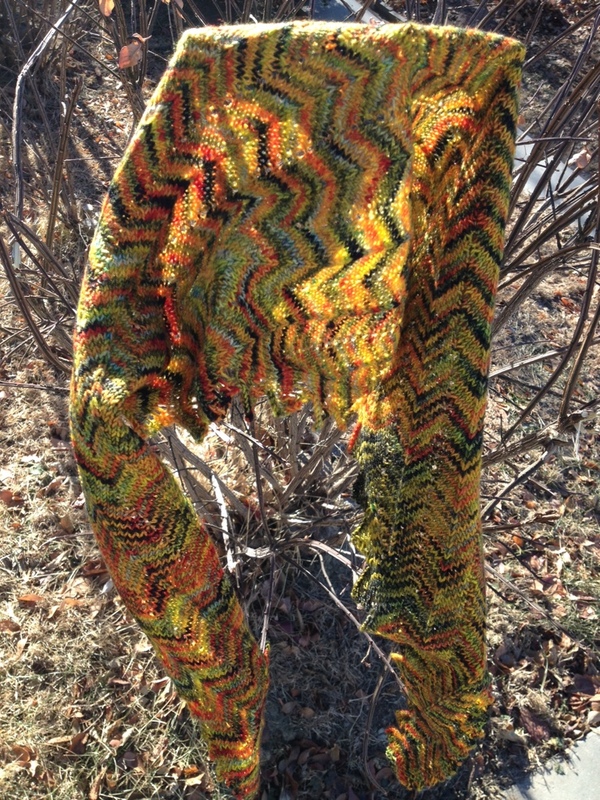 This is a testament to how fun the pattern is paired with beautifully dyed yarn. I gave this only a quick steam block so I could show it off. You may remember when I created these art batts and spun them into singles awhile back. I knew immediately that I’d need to make them into a cowl for my mom for christmas. First of all, the yarn was irresistible, I wanted to work with it immediately. 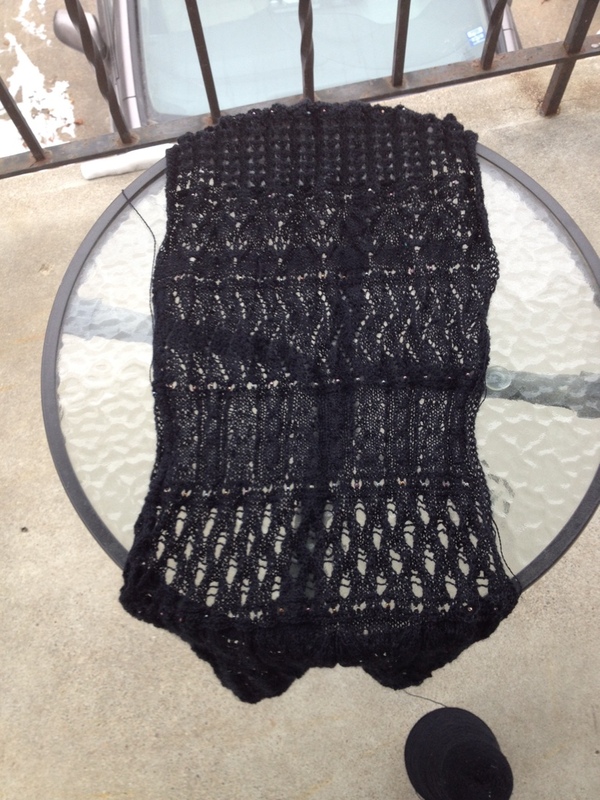 Secondly, the darker yarn, even with all the random bits in it, seemed to me to be something my mom could pair with a nice shirt and really get some use out of. And it was Christmas knitting time and I had not yet chosen anything to knit for her. So I chose the Sallah Cowl pattern. I liked the look of the waffley rib, and because it uses two differently sized needles, it becomes a wonderfully squishy fabric. I completed this quite awhile ago, but did not want to post it due to needing to wait until my mom opened the gift. I love this one. It turned out bright and yet still muted. If it did not have alpaca in it, I’d have been tempted to keep it! I don’t typically knit for my father. I once knit him a pair of socks, but they were commandeered by my mom, I don’t think he really wore them. Last year though, I did knit him an ear warmer to wear while riding bike. As someone who doesn’t like riding bike with a hat on even in the cold myself, it doesn’t surprise me that he actually got some use out of it. But, this year, since I was forced to knit most christmas gifts, I chose something very special. I’d been spinning on my jacob fleece batts for ages, and on looking for a scarf to knit for my dad, I got this great idea of knitting a horizontal gradient scarf. Using my jacob fleece yarn, I’d be staying with natural colors straight from the fleece and making something extremely unique. I ended up having to spin far more than I expected, but I adore the resulting scarf. It is really very special. And I am considering a matching hat in the future. I had trouble parting with this one as well, but the fact that I remembered that sheep keep growing fleece from year to year and I could always buy another jacob fleece and process it did help let this one out of my hands. I hope that my father is able to get some use out of it. 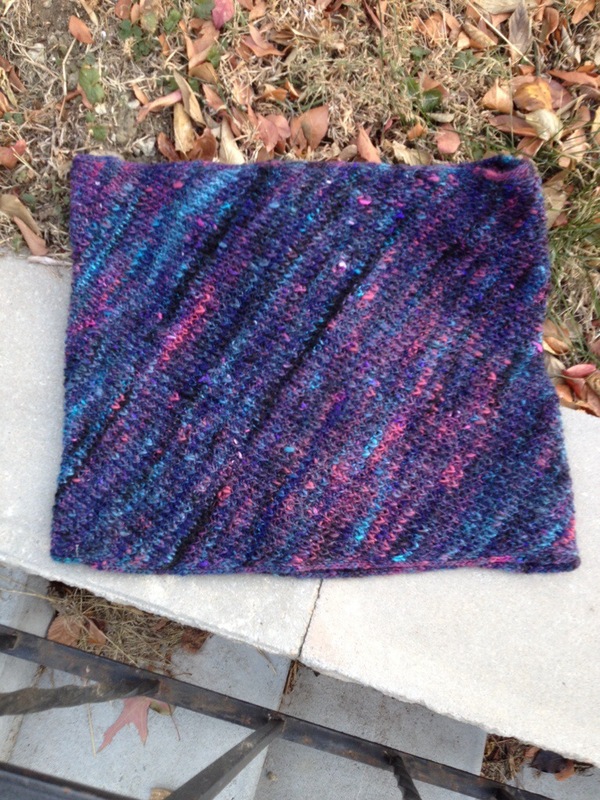 Meanwhile, I was forced to start my own horizontal gradient scarf out of handspun. 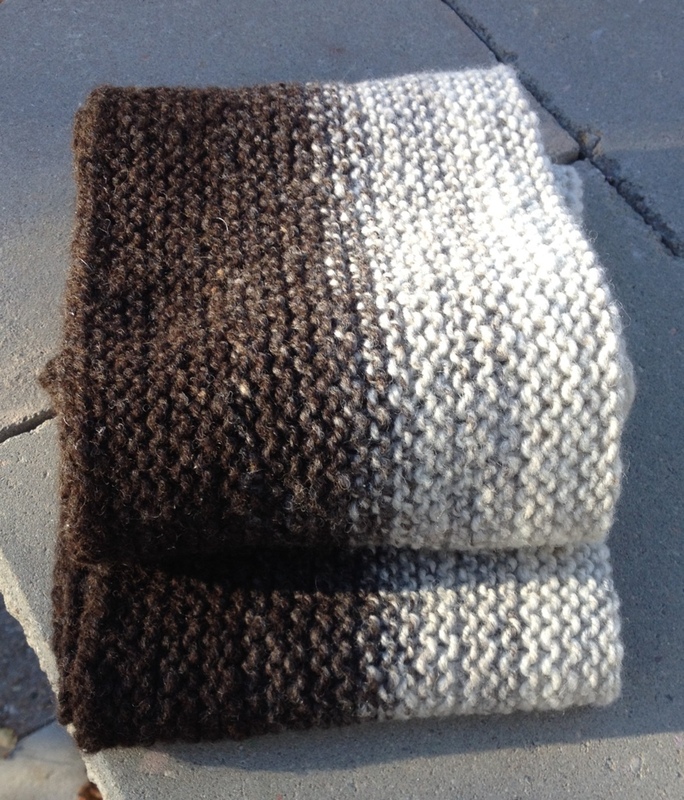 It is commercially dyed handspun, but similar effect. So, you know how I said I was going to do some sample knitting? I’ve gotten on that in a big way. I managed to knit half the vittorio shawlette in Eye of the Newt colorway in record time. It is nice to have a little extra time for it! I’ve knit this shawl before, and I forget how wonderfully quick it knits up. A very pleasant knitting experience. It is rhythmic and comfortable, not fussy, but also not boring. I hope to start on the next shawl tonight, might as well knit two at once! I’ve been asked to do some more sample knitting for Dyeabolical yarns. I am quite excited, as this was a joy to do 2 yrs ago when I took on two projects. This year I’ll be making two shawls in the next two moths. And the yarn has arrived! Pretty Pretty! The one with purple is Flower Shop Inferno and the other is Eye of the Newt. I can’t wait to see how these knit up! It has been a long while since I’ve knit any sort of SERIOUS lace. I get easily burned out on it lately, and just don’t feel like I have the time or energy to devote to it anymore. 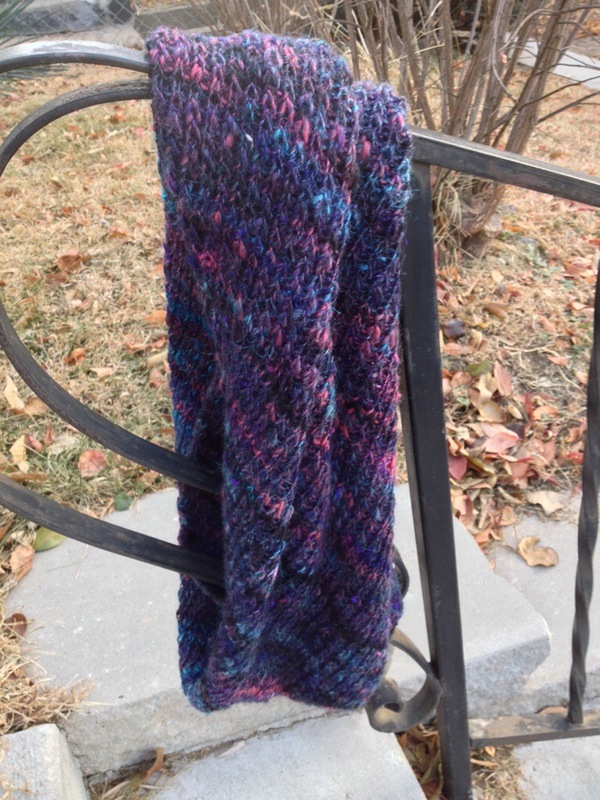 But this holiday season I decided to participate in the advent scarf knit along. While I haven’t managed to keep up exactly, seeing as I am only on clue 9, I have been enjoying it immensely. I hope to have a bit more time to devote to this in the near future! 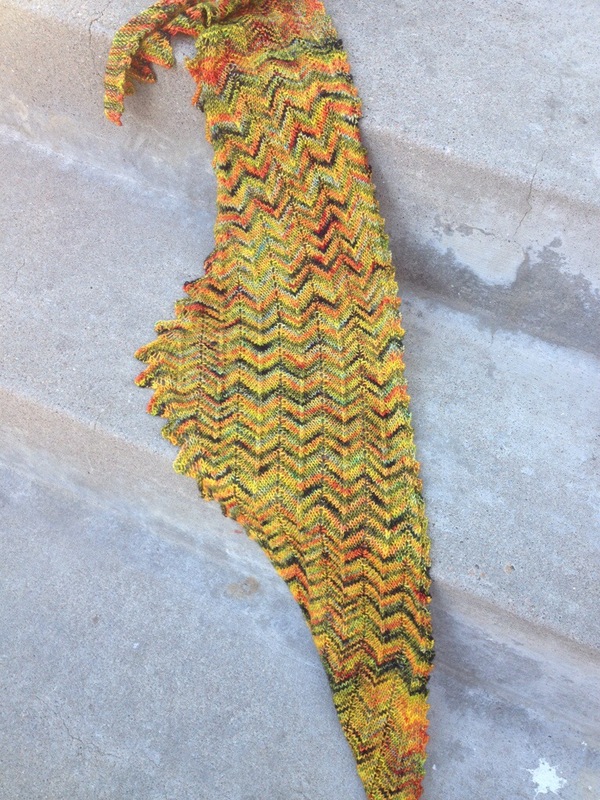 I’ve got a finished object post. Again. 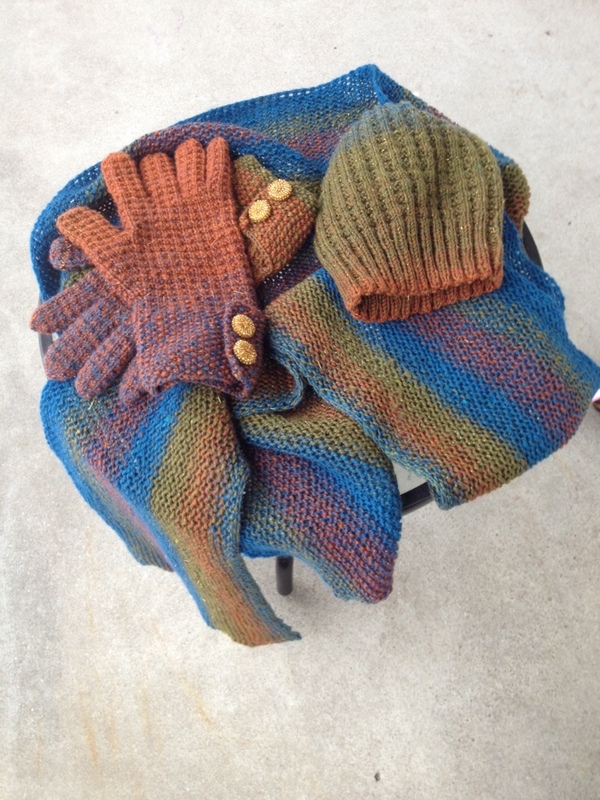 I finished the scarf that I knit to match the hat and gloves from my Autumn Lake loop bump handspun. My full set is complete, a lovely gift to myself. 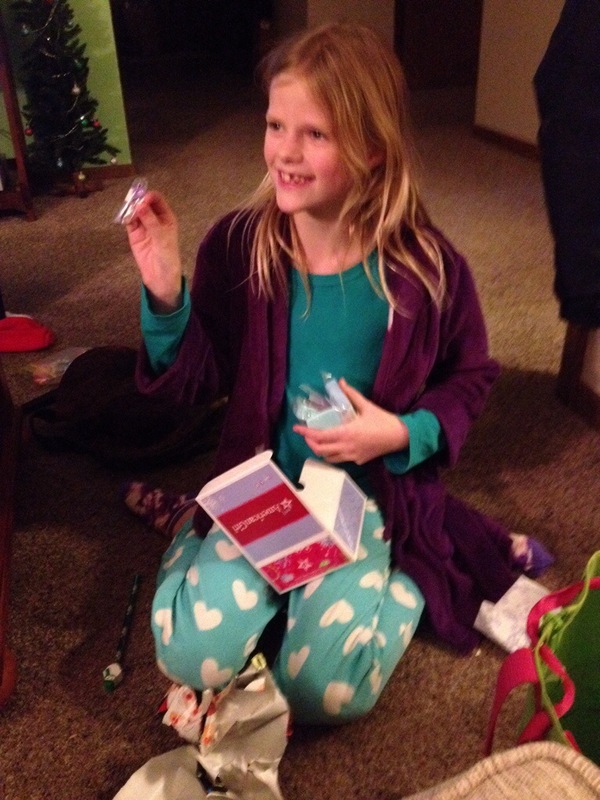 We also had a little time with my friend Marja, who was able to give Bug her very first Christmas gift this year. I got a photo of the joy on that little girl’s face, and figured I’d post that as well. There’s nothing like Christmas with a child around.